“Judy Blumesday” | Kid Reporters' Notebook | Scholastic Inc. 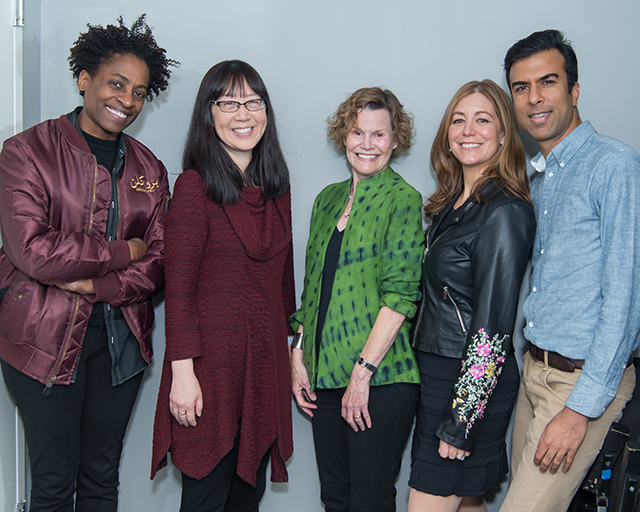 Authors (l. to r.) Jacqueline Woodson, Debbie Ridpath Ohi, Judy Blume, Rachel Vail, and Soman Chainani celebrate Blume’s life and work on February 4 in New York City. Judy Blume is the author of more than 30 books for young people, including Tales of a Fourth Grade Nothing; Are You There, God? It’s Me, Margaret; and her first title, The One in the Middle Is the Green Kangaroo, a picture book that was published in 1969. Lillie may be one of Blume’s youngest fans. A love of the author’s books has now been passed down from generation to generation. Author Jacqueline Woodson, who won the National Book Award for Brown Girl Dreaming and has several other award-winning titles, was also there to celebrate Bloom. “Her books helped me understand who I was as a 12-year-old,” Woodson said. “They really taught me about how a great author can write excellently about small moments in children’s lives.” The Library of Congress recently named Woodson the National Ambassador for Young People’s Literature.